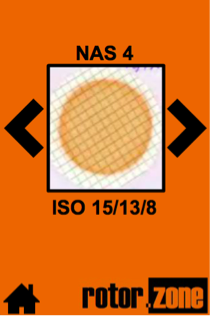 Q - Can NAS, SAE & ISO Cleanliness Standards be converted? A - It is not a simple conversion like converting meters to feet but NAS, SAE and the ISO Standards all measure the same thing so, at some level, they are convertible. The rotor.zone App conversion is based on manufacturers data, laboratory results and field performance. Q - Why are there two Absolute Filter ratings in the App? 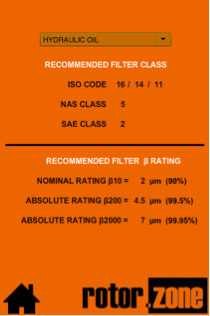 A - Absolute filtration is not a set standard and manufacturers are free to choose. In practice manufacturers generally quote absolute filtration as between 99.5% (β 200) and 99.95% (β 2000) efficiency so both are shown. Q - Why is the nominal Filter ratings set at β 10? A - Nominal filtration is not a set standard and manufacturers are free to choose. In practice manufacturers generally quote nominal filtration as β 2,5 or 10. 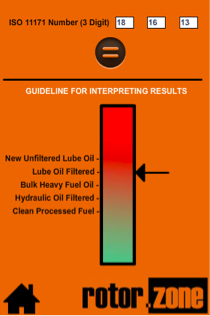 In practice β 10 (90% efficiency) is the most commonly used, in heavy industry, by reputable manufacturers.